It’s not intentional, we know. But we’re here to break some news: there are times where you are offending nearby noses with your breath without even knowing it! Most of us have created morning routines that are easy to keep. 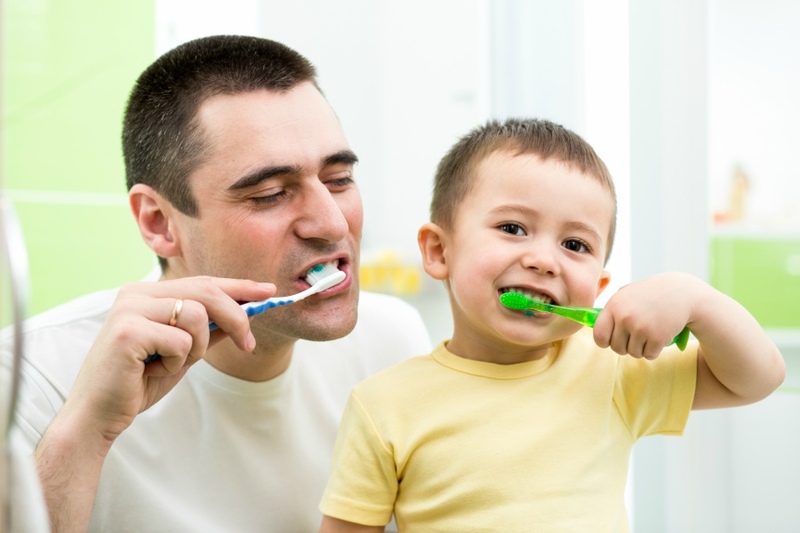 Brushing our teeth upon waking is as natural as blinking! But you also need to brush after a big meal, such as lunch. Many people don’t consider the midday meal as a potential cause for bad breath, but it is! Why you need to brush after meals: Food particles get left behind and trapped between our teeth. Bacteria slowly breaks down these particles, and odorous sulfur compounds are released, lingering on your breath for hours. Yuck! Tip: Keep an extra toothbrush and travel size tube of toothpaste at your desk at work, or in a bag that you take with you every day. Even if you don’t eat lunch at the same time each day, you can set an alarm on your phone or calendar for an afternoon brush. Water helps flush food particles and debris–that bacteria feed upon– from the mouth. Drinking this odorless fluid throughout the day promotes the production of saliva. We need saliva, as it acts as a continuous cleansing agent, dissolving stinky substances in our foods and drinks. If You Drink Liquids Other Than Water: If you enjoy your daily cup of coffee or evening glass of wine, make sure to drink a glass after consuming either one! Caffeine and alcohol dry out the mouth, creating an arid environment–a breeding ground for sulfur compounds! Tip: Keep a reusable water bottle in your bag or at your desk, and fill it up throughout the day. Flossing not only removes stinky food particles crammed in the crevices of your teeth, it dislodges bacteria under the gum tissue that brushing cannot reach. This bacteria is dangerous if not removed–the sticky plaque builds up and hardens into tartar, which is difficult to scrape off. It can lead to gum disease as well. If Your Floss Smells Don’t panic, it might not mean you have advanced gum disease! The bacteria you’ve plucked from that particular spot is old…aged…vintage, if you will. Of course it’s going to have an odor! Tip: Dip your floss into mouthwash before flossing for an extra clean sweep! Tooth decay, cavities, and poorly-fitting dental devices (bridges, crowns, or dentures) all contribute to bad breath. Yes, these are issues you cannot monitor solely from the comfort of your bathroom mirror. Your regular six month checkups are crucial for maintaining your oral health. It is during these appointments that your dentist will carefully check your teeth for signs of decay or damage, and will be able to correct any ill-fitting devices. We love to keep our patients in Vienna, Falls Church, and Tysons Corner happy and informed! During your appointment, we’ll share tips with you on the best foods to eat and drink for fresh breath, as well as give you pointers on flossing like a pro! Call today for an appointment (703) 288-1800!